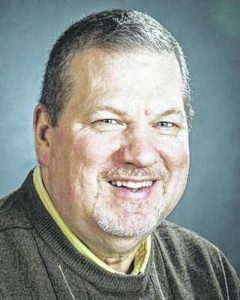 Russ Kent Column: What are you thankful for? I have a temperament that’s difficult to describe. I’m kind of moody … and grumpy … and impatient … and I don’t smile a lot. It’s easy to make me laugh. And I laugh a lot in public. But I’m also easy to anger. That anger is kept under wraps most of the time. It mostly comes out at home. I’ll punch a wall, or slam a drawer or one of my cupboard doors. It feels good in that instant, but I know my tantrums are just stupid, and embarrassing. I’ve convinced myself that a temper tantrum now and then is actually good for my health. Those short tantrums are the only time I let out the emotions bottled up inside me. But then I feel bad. When I slam a drawer or door and yell out an expletive, my dog Beatrix runs away with her tail between her legs. Whether I’m cooking or reading or paying bills or texting my friends, she is always with me. But my outbursts scare her and she runs away with her tail between her legs to her safe spot on her favorite sofa. And then I feel terrible. I console her. Still, I don’t like how my temper tantrums make others feel. My anger also shows up at work once in a while, too, but in a different way. I’m notorious for the destruction of my computer mouse. It happened when I worked for Gannett, and it happens at the Galion Inquirer. I just did a quick check. I have a mouse on my desk that I’m using, and two more in my desk. That’s pretty much par for the course. I always have one — if not two or three — spares just a few feet away. Anyway tomorrow is Thanksgiving. And despite my penchant to not share much about me to anyone, there are lots of things I’m grateful for. First and foremost is my family. They put up with me, my moods and my tendency to just want to be left alone. But my sisters and brothers and parents and cousins are always there when I need them, or when any of us need one another. That’s rare in a many families. I have cousins and nephews and nieces and thy have their own children. I don’t have kids of my own, it was never in the cards for me. And even if I don’t get to all their events that I’d like to, I love watching those kids grow up. I’m thankful for my parents. They are aging but they were — and continue to be — great parents. Dad is beat up and his back hurts all the time, but if he’s able, he’ll do anything asked of him. My mom is in a nursing facility. She suffers from dementia. I’m not as good as others in my family at visiting her, but when I do, she is always glad to see me. Sometime in the future, she won’t recognize me or others, which is heartbreaking, but I’m thankful for the staff and caregivers at Signature Healthcare of Galion who take care of my mom and dozens of others. They do a job that I am pretty certain I would be unable to handle. My mom did everything for her kids. Cub Scouts, Brownies, Fall Festivals at North School. She went to all our sporting events and made clothing for us to wear. I learned to cook watching my mom in the kitchen. To this day, cooking and writing and reading are my favorite things to do. Without my mom, I’m not certain I’d have learned how to cook. The kitchen is my happy place. And for that I’m thankful. Some people don’t have a happy place. I enjoy cooking for friends and relatives. In my kitchen, I’m at peace. There is a history of men cooking in this family, My grandfather Ralph Bowman always prepared the holiday meals when we visited him in Mansfield. In our family, on the holidays, I cook the meat and make the gravy and maybe a side dish or dessert. This year, I’m catering a Thanksgiving dinner for 40. And although it’s taken up a lot of time the last couple of weeks, I’ve loved every minute of it. And tomorrow, although they don’t know it, my twin nephews will be helping me deliver that meal. I’m also thankful I have two nephews I can borrow from time to time. I guess that’s what I’m most thankful for today … my family. And if I don’t say if often enough. Hell, I never say it. I love you guys. I’m thankful for my friends in Galion, who also put up with my moodiness. And I’m thankful for the friends I rarely see and rarely talk to anymore. I miss you more than you can imagine, but I’m grateful for the friendships we developed before careers and family pointed us in different directions. But enough with that sappy, un-Russ Kent-like drivel. Here are some other things I’m thankful for. I’m thankful the Browns have learned how to win again. Baby steps are better than backward steps, folks. I’m thankful that Ohio State keeps finding ways to win on the football field. I’m also glad to see that all of my friends and family, who for some unknown reasons grew up to be University of Michigan fans, are alive and well and have found their voices again. I’m missed you guys the last six years. Although tomorrow is Thanksgiving, for retailers and shoppers it also is the day before the official start of the shopping season. This Black Friday countdown started what? 363 days ago? I’m thankful I’ll not be stepping foot in any shopping establishment at anytime on Friday. Been there, done that! Once was more than enough. I am also thankful to the person who invented gift cards. The older I get, the less I enjoy crowds at sporting events, in bars, in shopping malls and in big box stores. So sometime in the next couple of weeks I’ll spend 30 minutes or so buying gift cards for Christmas. So I’m greatful for that fantastic time-saver. Happy Thanksgiving folks, and don’t forget to say thanks to all of those people and things for which you are thankful.